PRETORIA, South Africa – It may have been a win for the prosecution, but it could end up helping the defense. As Courtroom GD waited for Judge Thokozile Masipa, a grim-looking Barry Roux – defense attorney for Oscar Pistorius – walked into court. Heading straight over to Pistorius in the dock, he pursed his lips and shook his head. After a brief, whispered exchange, the Paralympian – who shot and killed his girlfriend Reeva Steenkamp in the early hours of Valentine's morning last year in what he claims was an act of mistaken identity – took his seat, head bowed, seemingly resigned. 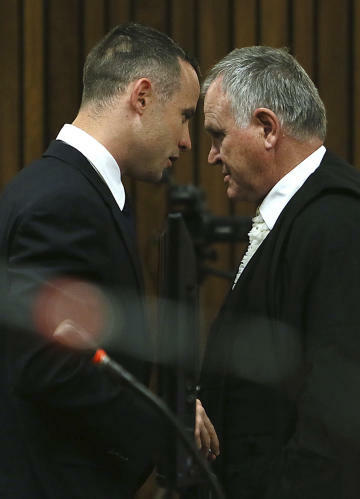 In a series of animated huddles, Roux spoke to members of the Pistorius family, gesticulating as he appeared to explain why it wasn't all bad. The prosecution said they wanted the murder accused sent for a 30-day psychiatric evaluation, and on Wednesday, Judge Masipa granted their wish. "The question is whether there was a reasonable possibility that a referral of the accused for observation … would reveal … that at the time the crime was committed the accused suffered from a mental disorder which could have resulted in his not being criminally responsible for his act," she told the court. Masipa's decision came down to her interpretation of South Africa's Criminal Procedure, which essentially says if it's alleged, or if it appears to the court that Pistorius "by reason of mental illness or mental defect," may not be criminally responsible for his actions, he should be referred for observation. During testimony Monday, Merryl Vorster, an expert for the defense, testified that she had diagnosed Pistorius with generalized anxiety disorder (GAD). In explaining her ruling on the application, Masipa quoted Vorster, saying that while GAD may not be a mental illness, the psychologist also said, "I think it is clear that Mr. Pistorius has a psychiatric illness. He certainly was able to appreciate the difference between right and wrong, but it may be that his ability to act in accordance with such appreciation was affected by this generalized anxiety disorder." The latter part of that statement is critical: Under South African law, it means there's a possibility Pistorius can't be held "criminally responsible" for his behavior. "Having regard to the facts of this case," Masipa said, "I am persuaded that the requirement of a reasonable possibility has been met." What happens now and how long will it take? Trial proceedings are now postponed until the observation process is completed, which could take until July. The prosecution and defense will now put together a joint court order, which will be submitted to Judge Masipa on May 20. It will include the details of where Pistorius will be sent for observation and how the process will work. In her ruling, Masipa said, "The aim of referral isn't to punish the accused twice." She specified that she would prefer Pistorius to be treated as an outpatient – staying at home and reporting daily for observation, instead of residing at a hospital. It is most likely Pistorius' psychiatric evaluation will take place as Weskoppies Psychiatric Hospital in Pretoria, which is the largest in the province and conveniently near his home. The standard observation period is 30 days, but it will only begin when the required hospital resources become available. During that period, a psychiatrist will assess the accused fairly frequently, psychological and other medical tests and investigations may be done, and the observations of nurses and others will be taken into account. A report is then prepared for the court by a panel of experts, which will state whether Pistorius is fit to stand trial, if he was criminally responsible for his actions, and what they should take into account during verdict and sentencing. South Africa has a shortage of forensic psychiatrists and facilities, with months-long waiting lists at most. Legal experts estimate that Pistorius, being a high-profile case, will only have to wait for a week or so. Presumably, being an outpatient will also reduce the waiting period, not requiring a bed. Masipa acknowledged that her decision to grant the referral application will cause "inevitable delays," but was resolute. "This is not about anyone's convenience but rather about whether justice has been served," she said. "It is necessary to emphasize that an application of this nature is never taken lightly as it is an integral part of a fair trial." Was this a strategic move by the prosecution? It's extremely unusual for the prosecution to make a request for psychiatric observation and it's usually a tactic of the defense, which may want to show that its client should not be held "criminally responsible" for his behavior. 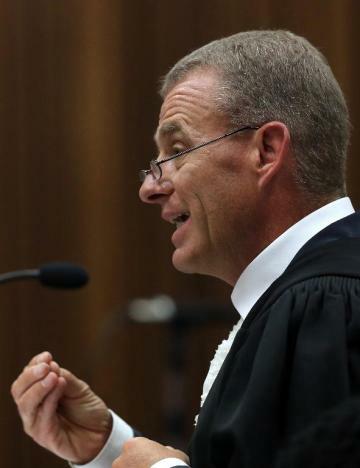 In making such an application, prosecutor Gerrie Nel could have two strategic objectives: to prove that Pistorius was actually of clear mind when he fired his gun and to prevent the defense from raising the murder accused's psychological state as a basis for appeal, or even a mitigating factor during sentencing. It's not clear if Nel expected Masipa to even grant his application, or if he needed her to. Given that the defense vociferously opposed the referral, it would have meant that if Masipa had refused the request, it would not have been able to raise Pistorius' "mental disorder" at a later stage to ask for leniency. The prosecution might have also argued – on that basis – that if the defense did not deem the athlete's GAD significant enough to his state of mind on Valentine's morning that it would want it independently confirmed, it should be entirely disregarded. Nel has already told the court he believes Pistorius was of "clear mind" when he fired and presumably hopes the panel of experts agrees with him. But, the gamble could backfire fairly spectacularly: If the panel of experts returns a report that reiterates Vorster's evidence (which Masipa has already acknowledged supports Pistorius' account of events), or if it decides the Paralympian lacks "criminal responsibility" for the shooting, which means he can't be convicted of anything at all. Did the judge just do Pistorius a favor? In her ruling, Judge Masipa said it was "strange" that the application was opposed on behalf of Pistorius. Pistorius has, until now, not put forward a defense of "mental illness or mental defect" when he fired four shots through a closed door. But, as Judge Masipa pointed out, his defense called Vorster to testify, and "the effect of the evidence is that a doubt has been created that the accused may possibly have another defense relating to his criminal responsibility." Essentially, she's saying, dependent on the psychiatric evaluation findings, that Pistorius may have another viable defense: that of his mental state. If the panel's findings are the same as Vorster's, the referral simply strengthens Pistorius' case, that of "putative self defense" in which he says he fired out of a perceived fear for his life. If the panel finds Pistorius' GAD amounts to a "mental illness" that has much larger implications. If Oscar Pistorius is found to have a mental illness, can the trial proceed? If his psychiatric evaluation report shows Pistorius has a "mental illness," which prevented him from acting in accordance with his understanding of right and wrong when he fired those shots, then he cannot be convicted. He will be deemed to lack "criminal responsibility" for his actions, and the trial will be over. Pistorius would be sent to a psychiatric facility for an indefinite period, which is however long his treatment team deems him to be a "danger to society." That period could last years or be as brief as a few days if it's decided he was a danger when he shot Steenkamp, but no longer poses a threat. He would then be released, either subject to certain conditions or unconditionally. It sounds extreme, but is also fairly unlikely. In her testimony, Vorster – a defense witness – said she did not consider it likely that evaluation would find that Pistorius should not be held criminally responsible for his actions. If Pistorius is convicted, will this affect his sentence? Possibly. Usually an issue like Pistorius' GAD would be raised after a verdict, at the time of sentencing, as a mitigating factor demonstrating "diminished responsibility" for the crime. It is possible for a psychiatric referral to be requested at that time – during sentencing – but, if one has already been completed, the defense can ask for its findings to be considered in determining punishment. Will this delay mean more bills for Pistorius? No. The psychiatric observation process is requested – and paid for – by the state, and will take place at a state-run facility. In the meantime, Pistorius' defense team has said it will continue working on other cases, so he won't be footing the bill for its time (estimated to be some $10,000 a day, including forensic experts), while he is being assessed. What does the Pistorius family think? Pistorius appeared calm, but sober-faced as he left the courtroom Wednesday. Speaking on behalf of the family to journalists outside the courthouse, the athlete's uncle, Arnold Pistorius, said Masipa's ruling had reaffirmed their confidence in South Africa's justice system. "As a family, we are comforted by the thoroughness and detail of this judgment and Judge Masipa's commitment, using every avenue to ensure a fair trial," he said. Of his nephew's 30-day psychiatric observation, Arnold told one reporter, "He'll be fine, he's a strong boy." Oscar Pistorius will return to court on Tuesday, May 20, for Judge Masipa to hand down her court order.